Blouse by Piazza Sempione, jacket and pants by Designers Remix Charlotte Eskildsen, hat by Malissa J and shoes vintage. Blouse by MM6 Maison Margiela, skirt by Martha von Günther, coat by Brian by Brian Rennie, hat by Staatsoper Hamburg and boots vintage. Pants by Brian by Brian Rennie, poncho by Fiora Blue and hat by Art + Style by Hüte Falkenhagen. Blouse by MM6 Maison Margiela, skirt by Martha von Günther, coat by Brian by Brian Rennie, hat by Staatsoper Hamburg and boots Vintage. Blouse by Mes Demoiselles, pants by Designers Remix Charlotte Eskildsen, hood by Staatsoper Hamburg, bag by Mango and shoes Vintage. 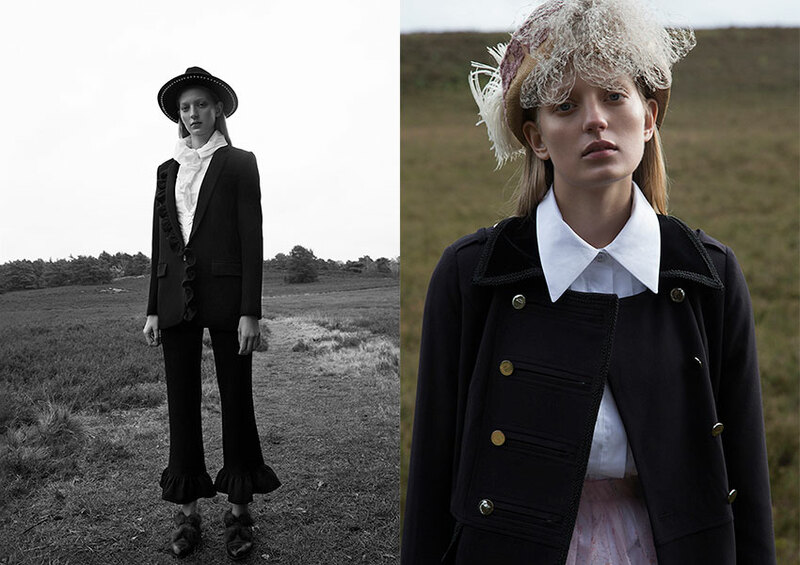 Blouse by Piazza Sempione, jacket by Designers Remix Charlotte Eskildsen and hat by Malissa J. Jacket by Brian by Brian Rennie, pants by Marcel Ostertag and hood by Ioanna Auschra. Photography by Alex Weber, fashion by Ioanna Auschra, hair and makeup by Josie Martens@ Bigoudi and modeling by Marie Louwes@Mega Model Agency. Creative info: Alex Weber.